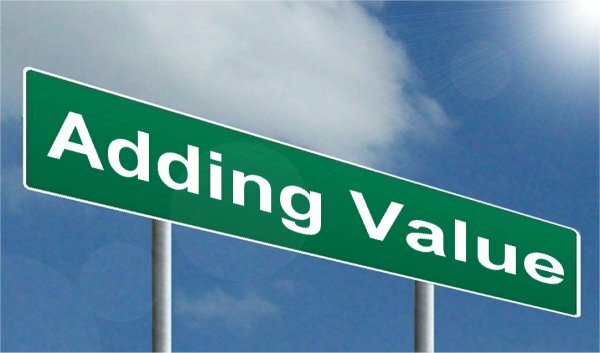 Adding Value – What It Is, What It Isn’t, and How Important Is It? Over the 24 years that I’ve been a loan officer, I’ve tried to add value to my clients and my Realtor partners as a way of differentiating myself from my competition. To me, adding value is providing something of value that isn’t expected as a part of the normal service. I watched a video the other day of a Realtor interviewing one of her preferred lenders and the three things he said he offers his clients as added value are 1) the company he works for is a direct lender, 2) the culture of his company is to remember that they are serving people and that they don’t look at it as a loan, and 3) he becomes friends with some of his clients. I had to shake my head at this because the truth is that being a direct lender isn’t necessarily better than being a correspondent lender or being a broker. The true answer is that it depends. Here are the facts: first of all, pricing depends on volume and there are lots of correspondent lenders who get better rates than direct lenders because the lenders / servicers they sell to get better pricing than smaller direct lenders. Another important thing to note is that the processing of a direct lender isn’t necessarily better because ultimately it depends on the competence of the people – having done this for about 24 years, I can say with confidence that the people I work with at my company are among the best in the industry. We have helped many people get loans who were denied elsewhere. Finally, it’s great when you make friends with clients – I’ve done that with many clients throughout my years in the business, but is that really adding value? To me, providing great rates and top-notch service should be the normal course of business for a mortgage company. Here are my thoughts on things that add value. Educate borrowers about wealth creation strategies so that they have the information they need to make an informed decision about their loan and how it’s structured. Teaching about things like time-value of money, leverage, the 2-in-5 home sale gain exclusion rule, depreciation, 1031 exchanges for deferring taxes on the sale of investment property and related topics is a great way to add value to clients. Many clients have asked me why other loan officers they have spoken with haven’t talked about these things so I know these things are important to my clients. Offer things that the average mortgage company or loan officer doesn’t offer like loan solutions beyond the regular conventional, FHA, and VA programs. Things in this category would include the ability to lock a rate for longer than 90 days or to float down the interest rate if rates improve by a certain amount after you have already locked the rate. Down payment assistance programs are fairly common and I think they can be overused since there may be other options and the terms aren’t always the best. This one is for Realtors, but some of these things can also benefit their clients. Offering strategies to help them generate more business is a great way to connect great experts with clients who need their expertise. I don’t want to share what strategies and tools I use to help generate more business for my Realtor partners because I don’t want to give my secrets (or my competitive advantage) away, but when there are cost-effective things that a lender can do to help Realtors get more business, it’s a win for everyone. Let me know your thoughts either on what you do to add value to your clients or what you have received in terms of value-added service. For Realtors, Real Estate and Wealth Creation, Realtors and Borrowers home buying, home loans, home mortgage, Mortgage loans, real estate, Realtor. permalink. What is the Return on Investment on the Equity in Your Home?